Chateau Gruaud Larose. It is of the St Julien appellation. The terroir is typical for the region, planted with 57% Cabernet Sauvignon, 30% Merlot, 8% Cabernet Franc, 3% Petit Verdot and 2% Malbec. 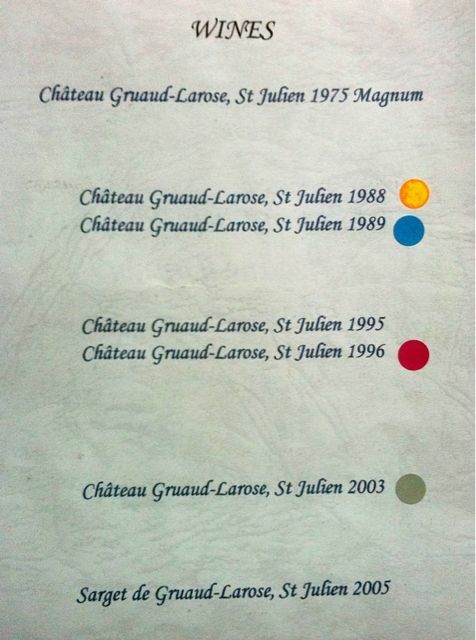 The grand vin is Chateau Gruaud-Larose (about 25000 cases produced per year) and the second wine, introduced in 1979, is Sarget de Gruaud-Larose (about 16000 cases are produced). It’s long been produced in a firm, masculine style, more recently with perhaps more finesse. 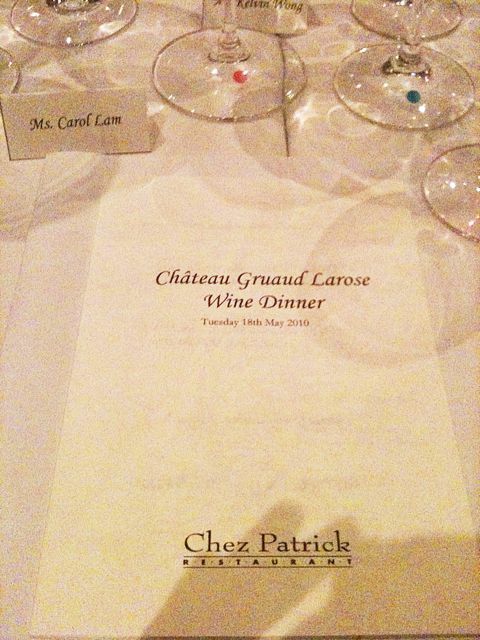 Went to a Chateau Gruaud Larose Dinner at Chez Patrick invited by OneReddot. I’d been to the Sun street Chez Patrick (next to Star Street, how cute they finally comes to term and become close neighbor!) but not this in Soho. It is a cute petite french restaurant. I especially like the bar area a few steps up next to the dining area, private and frenchy in a cute way. We had the whole restaurant there, romantically (I guess that’s only me); exclusively. To start with, we had the 1975 Magnum. It’s HEAVY! I was holding the bottle and realized the label was new for a 35 years old wine (it’s like 60 years old overly botoxed lady. You prefer/not prefer?). So I asked David Launay, the Director of the Chateau, whom sit opposite of me. David said all label is stick on only before it release out of Chateau. I thought for a second and decided to prefer seeing the “time” aspect superficially from the touch of the bottle to later on the “inner” self evolution in a wine. Anyway, the “inner” was light brown in glass and the nose with deep dark fruit. caramel texture on the palate and soft tannins. Then vintage 88, 89, 95, 96, 03 and 05 were being served during dinner. During dinner, I quite like the 96 one. Cherry and spice on the nose, the palate is rich and sweeter than the others with a smooth finish. 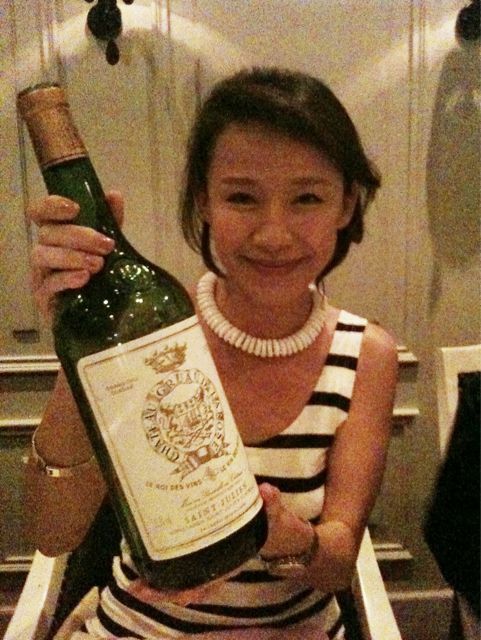 I like the 03 as well with a bit of juicy chocolate note, quite masculine style.